The foul-mouthed Congresswoman who referred to President Trump as a “motherf—-r” this week, rose to power via globalist billionaire George Soros. Congresswoman Rashida Tlaib (D., Mich.) failed to disclose her financial ties to Soros – as required by the House ethics committee – and also disclosed a lesser amount than what she actively received, according to a review of tax forms. Freebeacon.com reports: The Washington Free Beacon obtained the most recent copies of tax forms for a number of Soros’s organizations, including the Open Society Institute, the legal name for the Open Society Foundations, the entity in which Soros pushes millions in funding to a number of liberal causes and organizations. A spokesman for Soros’s Open Society Foundations said Tlaib’s fellowship was terminated earlier this year when she informed the group she would be running for Congress..
Kendra Arnold, executive director of the Foundation for Accountability and Civic Trust, a Washington, D.C.-based watchdog group, said that Tlaib’s failure to report the source of her income is “problematic” due to rules requiring that the income source be identified. Candidates are required to disclose the name of groups and organizations that provide their source of income, according to the manual on financial disclosure statements from the U.S. House of Representatives Committee on Ethics. Arnold said this discrepancy is not as clear and could be the result of hard costs associated with the program. Tlaib did receive any income from the Open Society Foundations in 2018, Soros’s spokesman said. 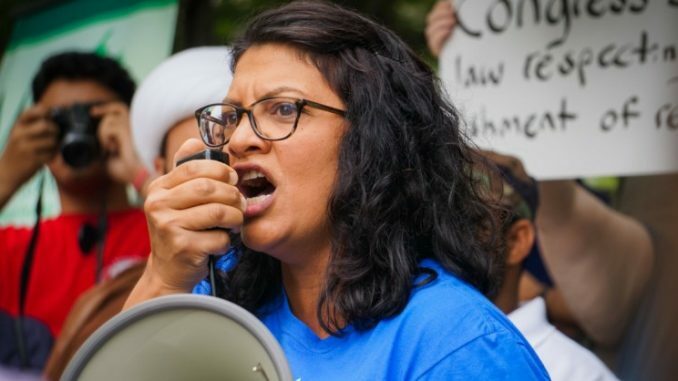 Tlaib’s campaign acknowledged receiving the Washington Free Beacon’s inquiry but did not explain why the source of funding was excluded from her financial disclosure forms and why the amount is lower than what she actually received by press time.